Free toys or free loo roll – the choice is yours! I write a lot about saving cash but I’m now going to tell you about a way to make some extra money. If you like me are dreaming of buying your own home, or treating the family to a special holiday or just need to stretch the wages until the end of the month then read on! I’m afraid it’s not going to make you a millionaire but it does generate funds and you can use them to buy household essentials or treats or gifts for FREE like I’ve done. 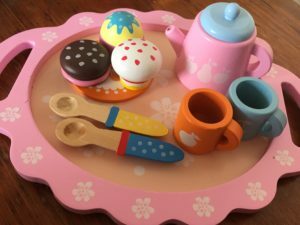 My most recent freebie was this gorgeous little wooden tea set (above) for the youngest member of our family…normally £17 !!! So how does it work? 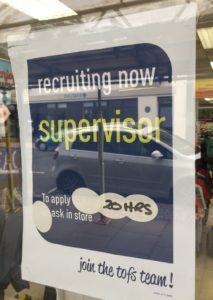 Well it’s called Job Spotter and it’s an app you add to your phone to take photos of job ads (like the ones below) in shop windows. 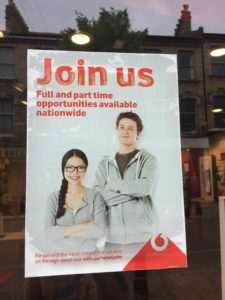 Each ad you capture earns you points and therefore pennies as job site Indeed then advertise the vacancies. You can then cash in your credits as Amazon vouchers whenever you like. The smallest amount I’ve cashed in is just £6 and you can easily earn this in less than an hour walking round your local shops. I do it whilst I’m shopping so it really doesn’t feel like a chore. Of course nowadays you can buy pretty much anything on Amazon so whether you use the vouchers to bulk buy some cheap toilet roll or save money on pet food or maybe treat yourself to some new make up or shoes, that’s your call. Snap Independent shops, cafes, fast food places etc. You get more points than the high street shops. You can revisit places but you have to leave it at least 30 days before posting same pic again. Use the app when you’re visiting another town and if you travel a lot and have spare time then this is perfect for you! Be careful as it’s addictive! 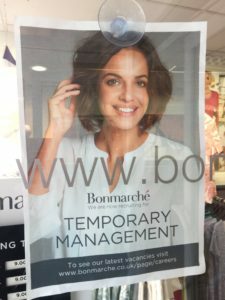 I was visiting friends recently in Bath and I’m sure they thought I was crazy stopping every 5 minutes to take photos of job ads. Join the Super Savvy Vegan Facebook group for more money making ideas plus I’m on twitter and Instagram.